Photo Booth Express’ social media photo booth is packed with powerful customization, social media and branding features to make your next event a sure-fire success. 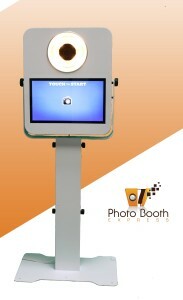 Along with it’s sleek and modern design, this photo booth kiosk packs a social media punch. Your event guests can upload their photo booth pictures to Facebook, Tweet them out, email them or text them all from the social media photo booth. Additional social media kiosks can be linked to the photo booth so your guests can spend more time uploading their photos without slowing down the line at the photo booth. If you are using the photo booth for marketing purposes you can brand the booth along with all of the photo strips with your company logo, tag photo uploads to Facebook and Twitter with your custom hashtag and set the booth to collect email address for future marketing campaigns. For company parties or trade-shows (or just to have some plain-old-fun at any event) the photo booth’s contest mode can be set to print a “winner” logo on random photo strips for contests or prize giveaways. Want to take it further than photos? Our social media photo booth has the capability to do full and slo-motion video! Your guests can also create Memes by typing text onto their photos or even create animated GIFs. For more information about the social media photo booth for your next event contact the Chicago photo booth experts at Photo Booth Express today at 877-492-6684.